De Blasio's plan to tax the rich: How far out there? New York City Mayor Bill de Blasio has drawn national attention with his progressive agenda, a key piece of which is to push for higher taxes on the rich to pay for early education and after-school programs. "Asking those at the top to help our kids get on the right path and stay there. That's our mission. And on that, we will not wait. We will do it now," de Blasio said in his inaugural address on New Year's Day. Getting support for his proposed education programs may prove easier than getting the nod on his plan to pay for them. 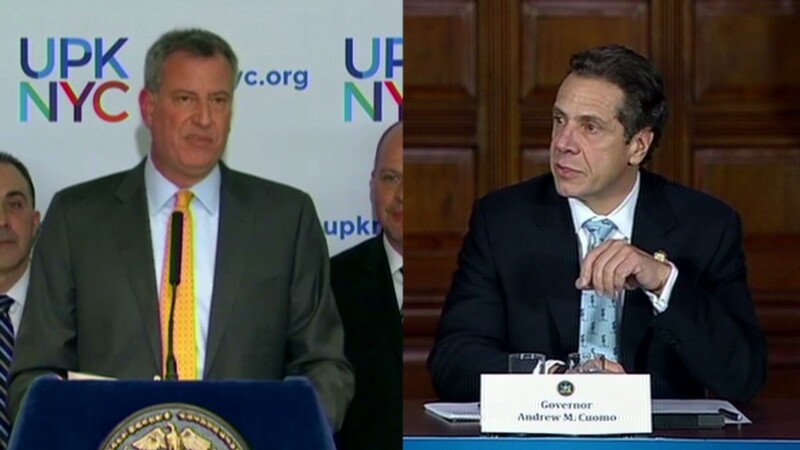 Any city tax increase must pass muster with New York State leaders. And the governor, Andrew Cuomo, just offered a $2 billion tax relief package. De Blasio wants to impose a 5-year tax increase on New York City residents who report more than $500,000 in taxable income. The top tax rate on every dollar above $500,000 would increase to 4.41% from 3.88%. Even if enacted, the rate would still be below the highest in the 1990s, when the city raised it to 4.46% under Mayor David Dinkins to help pay for crime prevention and education. And it was 4.45% from 2003 through 2005 under Mayor Michael Bloomberg when the city was short of money. Under de Blasio's proposal, a single filer with $800,000 in taxable income could pay about $1,500 more a year than he does now, while a married couple with three kids making $1.5 million might pay closer to $5,200 more, according to estimates from the Independent Budget Office, which analyzes New York City budget and tax issues. And their top marginal tax rate -- which is imposed on taxable income over $500,000 -- would approach 53%, once the top federal, state and local income tax rates are combined. The proposal would affect roughly 40,000 New York City tax filers -- or 1.1%. And it would raise $532 million annually, the IBO estimates. The mayor has yet to specify details about what the new pre-K and after-school programs would entail, but a spokesman said $532 million could fully fund both of them for five years. The goal is to establish continuous funding for the programs, which often are only guaranteed funding for one year at a time. Beyond the 5-year period, the mayor would look to other sources to continue the programs' funding, such as revenue derived from economic growth or other savings from the city's more than $70 billion budget. Of course, de Blasio is not the first, nor will he be the last, major leader to propose tapping the wealthy to bolster government funding -- temporarily or otherwise. In the past couple of years at least eight states have considered doing so, according to Tax Analysts and tax information publisher CCH. Only some succeeded in pushing through increases. Among them was California. The state added a 1% surtax on income over $1 million to pay for mental health services, and it temporarily raised tax rates on people making more than $250,000, in part for education. California voters did, however, reject a proposal to raise state income tax rates on a sliding scale to help pay for, among other things, early childhood programs, according to Cara Griffith, editor in chief of state tax publications at Tax Analysts. Minnesota, Oregon and Maryland, meanwhile, raised the tax burden on filers with taxable income in the six-figures, in some cases to help pay for education. And in New York, Gov. Cuomo temporarily put the brakes on a big scheduled rate cut for high earners. In 2011, the top New York rate was supposed to drop to 6.85% from 8.97%. But because of a budget shortfall, Cuomo signed into law a much smaller drop -- to just 8.82% through 2014 -- for individuals making more than $1 million (and joint filers making more than $2 million). That more than preserved New York's standing as one of the most highly taxed places in the country. Correction: An earlier version of this article incorrectly said the 4.45% top rate was in effect for just 2004 and 2005.